Savor your authentic bulalo with this postcard view of Taal lake and volcano. Specs: Taal Lake, Taal volcano (smallest volcano in a lake), parks, fresh flowers and fruits.
. Erjohn Almark (Lawton bus terminal, Manila): P78 airconditioned.
. This is a regular tourist trail itinerary. I will make a non-traditional itinerary next time.
. Sonya’s Garden is located in Barangay Buck Estate, Alfonso, Cavite (about 12km away from Tagaytay city rotunda).
. Breakfast at Sonya’s Garden is available from 8:00AM-10:00AM at P427 net per person. This info was taken from their website.
. People’s Park in the sky is also known as the Palace in the Sky. It is the highest point in Tagaytay. You will see ruins of former president Marcos’s mansion and catch a glimpse of Tagaytay Highlands, an exclusive country club, from up here. Entrance fee is P15 per person. Parking fee is P20.
. People’s Park fruit stands sell cheap fruits, especially pineapples (Tagaytay’s major crop).
. The Picnic Grove was once a popular stop for first time Tagaytay visitors. But now, there is pretty much nothing else to see or do in there, so you may skip it if you are short on time.
. The Tagaytay rotunda is the boundary between Silang, Cavite and Tagaytay. It is also the site of the historical 11th Airborne Division marker.
. There are two roads to Talisay, Batangas: One is near the Tagaytay Elementary School and the other one is near the rotunda (Taal lake road). It is safer to drive on Taal lake road because the one near the picnic grove is steep and winding. Make sure you have enough gas to make the trip back to the city proper.
. For commuters, hiring a van to Talisay is an additional P1000, while a trike/tricycle is an additional P300 up to 4 people.
. There are a lot of lake resorts around Taal lake (in Talisay), where you can stay for lunch and arrange your boat trip.
. The boat trip to Taal Volcano Island takes about 20 minutes. You can arrange a boat trip to Barangay Looc/Lo-ok where most tourists go or to Barangay Eskirol where there are less tourists (according to locals). Not sure about the spelling of those two barangays.
. From my experience, horseback riding in Looc is somewhat a tourist trap. It can cost you up to P1000 per person. Some locals say that you can arrange a horseback ride to the crater for less in Eskirol.
. Hiking up to the crater is allowed and you only pay P50 entrance fee. Be ready to hike alongside horses because there is only one trail being used. It takes about an hour or more.
. The crater trip can be disappointing because it is a little expensive for most local tourists and the place is not well-maintained (calling the attention of the local officials!).
. Back at the city proper, I recommend dropping by Mary Ridge (Good Shepherd Convent) near the Picnic grove. They sell great halo-halo and their Baguio-famous Ube jam. There are other religious convents and retreat houses in Tagaytay but I’m not sure if they welcome walk-in visitors like they do in Mary Ridge.
. Taking a private car makes it easier to go around the different spots in Tagaytay.
. You may also take the route to Tagaytay via Aguinaldo Highway in Silang, Cavite (Olivares).
. There are plenty of hotels/travel lodges/budget rooms/inns in Tagaytay City, for those who wish to stay overnight.
. Instead of going to the Picnic Grove, you can go to the Filipino-Japanese friendship garden. Just pass the Picnic Grove and you will see it along the way, before heading for the rotunda.
. You can hire a tour guide on your way to Talisay – they are scattered on the road carrying tour placards. This saves you time to look for a resort and they can give you driving directions. Normal pricing is around P1500, which includes lake resort entrance fee, parking and roundtrip boat ride. They have government-issue IDs if you wish to verify their identities (also for your peace of mind, if you’re worried that you’ll be overcharged).
. One Destination is a popular hangout because of the familiar establishments and the great view of Taal lake and volcano. You may want to spend dinner here and drive late back to Manila. Take your pick from the following establishments: Cafe Lupe, Carlos Pizza, Henlin, Junzi Oriental Cuisine, Kitaro, Mile Hi Diner, Pancake House, Starbucks Coffee, Teriyaki Boy and The Grill by Antonios.
. If you want home-cooked meals ala carinderia, head for the small bulalo places scattered near the big satellite dish. You can also bring your own food and rent tables there. Table rental starts at P100.
. For commuters heading home, there’s a bus stop in Magallanes square, right in front of One Destination. You may also go to Olivares bus terminal.
. Other popular sites in Tagaytay are: Paradizoo, Bag of Beans, Casino Filipino, Restaurants, Laoag Sisters, Ilog ni Maria bee farm, Pink Sisters, Mushroom Burger, hotels, golf courses, small bulalo places, retreat houses and pasalubong/fruit stands. Small bulalo places: Cheap and good! 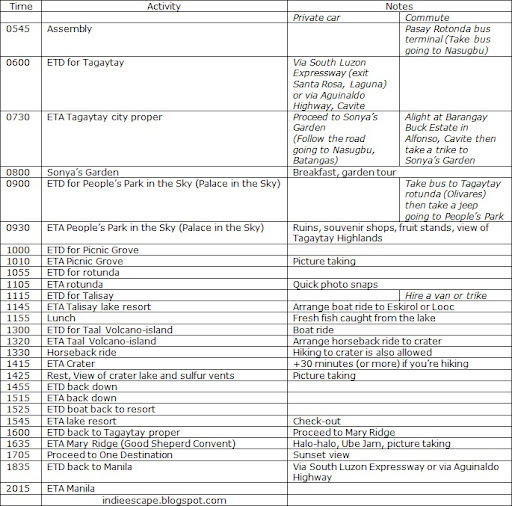 Itinerary and expenses recorded on June 2009. Can I ask how much is the entrance fee at Picnic grove this season? and also for the Peoples Park. I really need the info and I can't find their site to check for rates. Thanks. Thank you. This is indeed a great help! Very detailed itinerary. Thanks for posting this! Will definitely used this for future trip. Keep it up.